NOTE: some GPS take you into Aubrey and then back out, which is much longer! From corner of 380 EAST & Loop 288 out of Denton headed towards McKinney. You will go "about" 4 miles on 380 EAST. Then at the top of the hill you will be at a stop light, that corner is Discount Tire, KEEP GOING on 380 (FOUR) MORE STOP LIGHTS. At this corner you will be at FM 2931 (our road). There is a Circle K Gas Station. FM 2931 only turns to the LEFT. We are EXACTLY 2 miles down FM 2931 on the RIGHT side of the road. At the one mile mark you will GO PAST a stop sign, then the road curves and if you look you will notice 3 blue buildings on the left side of the road, which are auto repair shops. When you are in front of those blue buildings, START LOOKING ON THE RIGHT SIDE OF THE ROAD for our driveway. Our drive is the 3rd drive PAST the blue buildings. 2 flags -PURPLE AND GREEN (sometimes all green or all purple or purple and green). 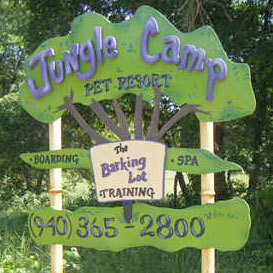 Sign that says Jungle Camp Pet Resort (it's set back off the road bit). On your right a sign on a pole has our house number, 2880. You will not see our home as we sit back off the road 520 feet. You will seeour sheep in the pasture.